Ideal for hosting events from 400 for dinner or 800 for a reception, the fantail is the largest area on the ship. Outdoors and tented aft, the fantail is on the Main Deck. This versatile space is perfect for everything from wedding receptions and cocktail parties to business meetings and trade shows. 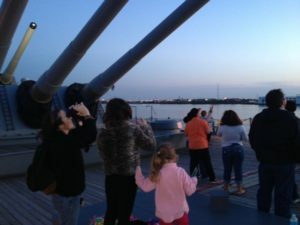 With the beautiful Philadelphia skyline as a backdrop, this spectacular area suits most functions and is handicapped accessible and can be heated in cool weather. Experience first hand how the Big J’s officers spent their meal time. This stately area is ideal for parties that include up to 80 for dinner and 100 for a reception. 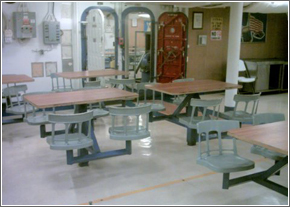 On the Main deck, the Officer’s Wardroom is also handicapped accessible. 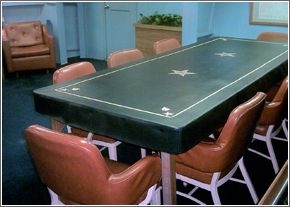 Petty Officers’ Mess and Lounge provide a unique location for corporate retreats or any event that requires a boardroom setting. Perfect for an occasion when a breakout room is required, this space accommodates groups of up to 50. 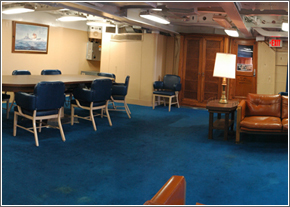 The nearby ship’s library is also available when an additional private meeting space is needed. This unique venue is even more intriguing when combined with overnight corporate retreats. This space can be used to serve an elegant sit-down dinner for 12, or to hold an intimate cocktail reception for 20. The 01 Deck, immediately adjacent to the Captain’s Cabin, provides indoor-outdoor versatility and dramatic views of the new and exciting Camden Waterfront and the Benjamin Franklin Bridge. 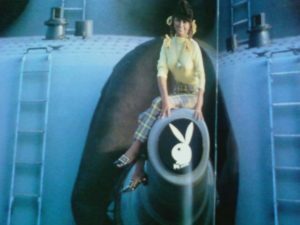 Imagine what it was like to sail with the legendary Admiral William F. “Bull” Halsey. 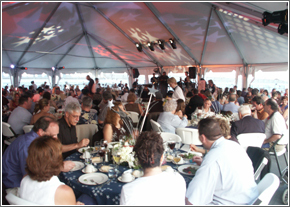 The Admiral’s Cabin accommodates seated guests for dinner or a reception. 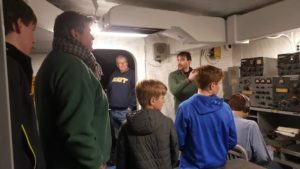 Outside the Admiral’s Cabin, on the port side, is the 01 Deck facing the Philadelphia skyline-a spectacular setting for small groups. 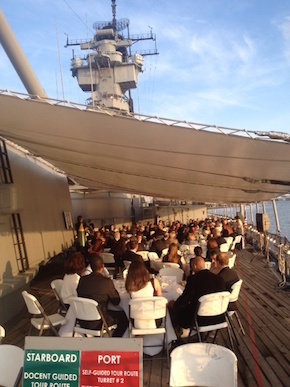 Outside in the forward section of the ship, the Forecastle provides a breathtaking location for outdoor events. 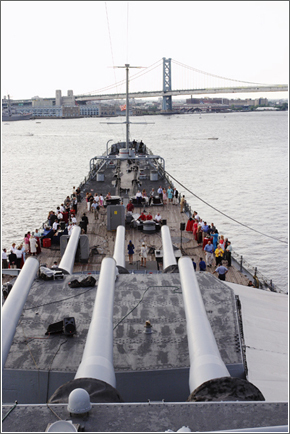 With the ship’s superstructure and two forward 16-inch gun turrets forming the backdrop, this unique venue offers panoramic views of the Delaware River, New Jersey State Aquarium, Benjamin Franklin Bridge, and the Philadelphia skyline. An ideal location for formal ceremonies of all kinds. This site is also handicapped accessible. Provide a unique experience for your guests. 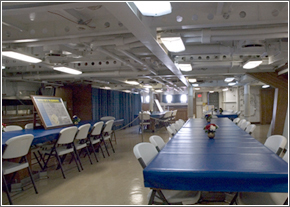 The Crew’s Mess is divided into two spaces. 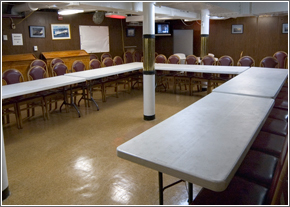 Crew Mess A accommodates groups up to 184. 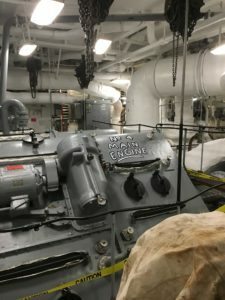 Crew Mess B holds up to 80. When combined, this space with stationary tables and chairs will hold up to 264 guests. Perfect for hosting cafeteria-style events, the Crew’s Mess will take you back to the times when nearly 2,000 members of the crew “chowed down” to that famous Navy cooking.